Thank God it's sweet corn season. My mom has been churning out batch after batch of homemade corn and black bean salad that is so irresistible, Riley and I have to practice intense self-restraint so as to leave at least one spoonful of the stuff for the other. There was a rich, sweet lobster and corn chowder at dinner only a few nights ago, corn has made its way into my big green salads, and I've been toying with the idea of a sweet corn ice cream. I'm pretty smitten. While corn isn't actually a vegetable (it was quite a blow to my health consciousness when I found that out), it still feels healthier than a hunk of crusty bread of a big bowl of silky noodles. I almost feel saintly when I choose a handful or two of popcorn over a bag of chips. It is whole grain, after all. So it just must be good for you, right? Glad we're in agreement. 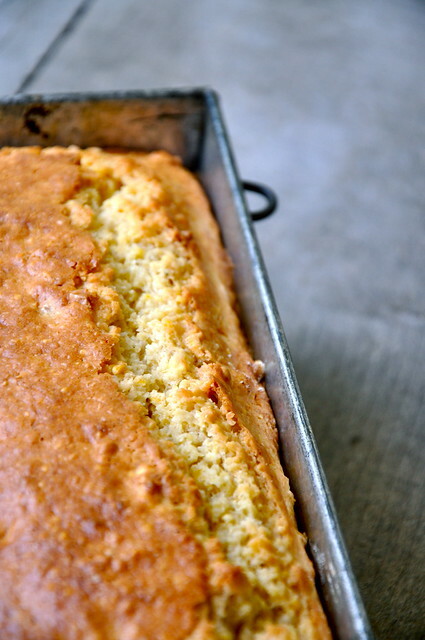 One of my favorite ways to indulge in the honeyed, golden grain is in the form of cornbread. At my house, we generally use a cornbread mix because it's quick and easy and churns out tasty, though not extravagant, results. But this time, after Riley's beseeching request, I wanted to make something from scratch. Originally, I was leaning toward a skillet-cornbread, only to realize that I do not have a single cast iron pot or pan. How on earth is that possible? So I decided to go with a recipe from the New York Times and give it a little tweaking here and there. 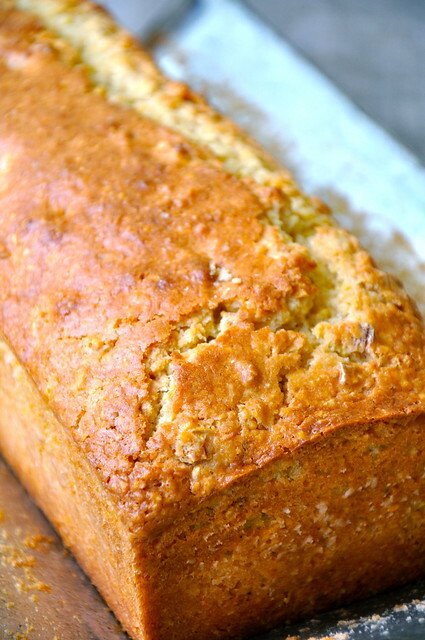 I love the extra hit of sweetness the kernels of fresh corn give to the bread. 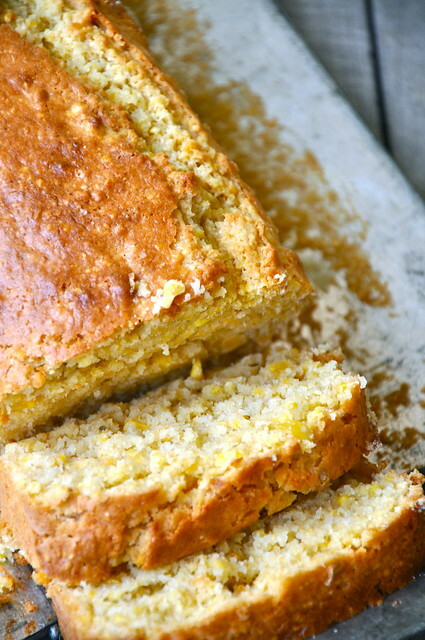 It is super moist and perfectly corny (in a good way, I promise). It makes as wonderful an accompaniment to a plate piled with barbecue as it does a special, indulgent sort of breakfast, slathered with salted Irish butter and a squirt of honey. Preheat oven to 350. 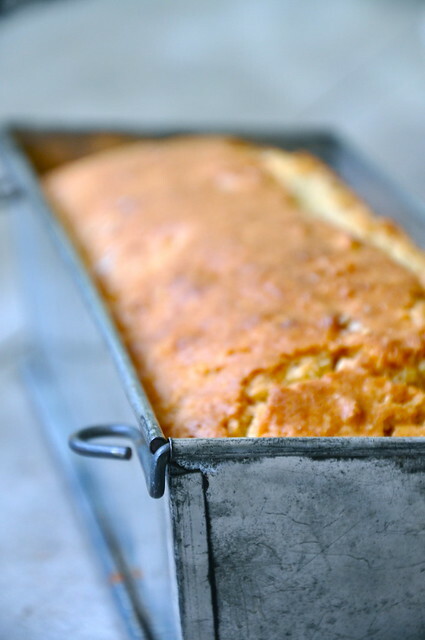 Grease a 9-inch round cake pan or loaf pan and put in oven to heat. In a large bowl, whisk together flour, cornmeal, granulated sugar, baking powder, and salt. In a separate bowl, whisk together almond milk, butter, and eggs. Pour almond milk mixture over dry ingredients and stir to combine, but be careful not to over-mix. Fold in corn kernels. Remove hot pan from oven and and pour batter into it. Return to oven and bake for 50 minutes to an hour, until cornbread is golden brown and a knife inserted into center comes out clean. Let cool.